My cousin Lydia who frequently rides the trail with her husband asked me to join her one day and I did. What I found was a beautiful, secluded place, perfect for someone like me who is not into an endurance test but simply wants to get some exercise and enjoy some local scenery. This is not to say that the trail isn’t frequented by the more dedicated bicycle enthusiasts; it is used by hikers, dog-walkers, young parents pushing strollers, people who like the occasional bike ride like me, as well as those riding through on an extended journey from other states. Amish buggies are permitted there as well and they take advantage of the opportunity to escape the busy main roads. Converted into a paved, flat surface from an old abandoned railway bed it stretches 16 miles from Fredericksburg to Killbuck with frequent stopping points along the way. Currently construction is underway to complete an under-the-highway tunnel connecting the upper trail to another beyond, taking it all the way to Brinkhaven. My favorite stretch begins at the Walmart parking lot to the edge of Killbuck. It’s mostly tree-covered and reminds me of a long leafy hallway, shaded and cool on even the warmest of days. Check out their site at Holmes County Trail. 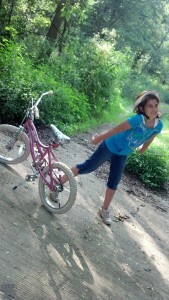 My granddaughter just learned to ride a two-wheeler less than a month ago. I took her out to the trail this week and she was awestruck at the long straight surface stretching ahead. She asked me today when we can go again. I’m determined to look a bit more closely at all the great things available in my own back yard. There’s a treasure trove of activities available within minutes of my house and it’s time I find out why all the tourists are coming to Holmes County.